Am I too old-fashioned? While Kindles are wonderful, the idea of using a digital copy of the constitution, or the Bible, to swear anything, just doesn’t seem respectful in some ways. This is a major-moment, perhaps once-in-a-lifetime ceremony. Would the ambassador have come to it in torn jeans and a dirty T shirt? Would she have driven to Vegas and gotten sworn in by an Elvis impersonator? 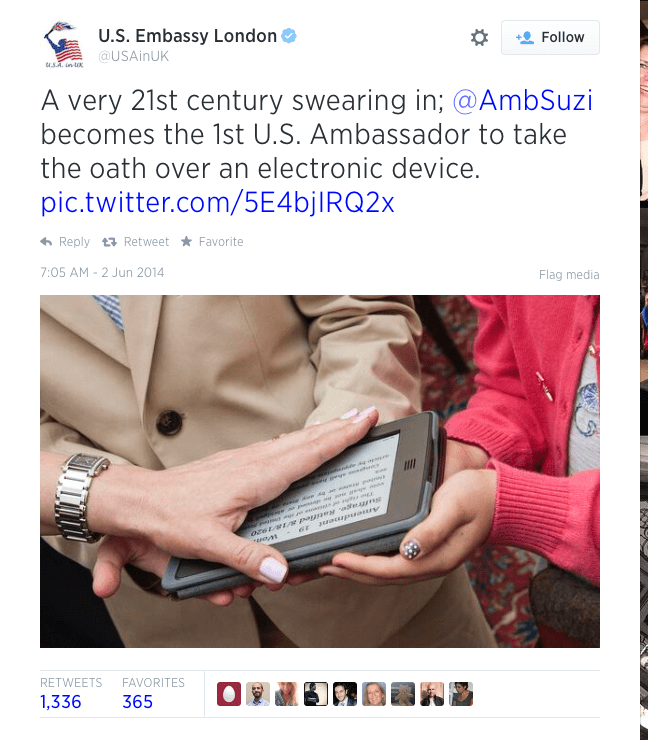 In one way it’s cool that the ambassador is tech savvy enough to realize that ebooks are the way of the future, but some traditions, in my lil’ ole opinion, shouldn’t be lost. I’d like to know that her oath is more solid than the momentary digital impression of words on a Kindle. What do you think? Tagged as: ambassador sworn on kindle, Diana Belchase, Digital oath, disrespecting tradition, new traditions, using digital media in new ways, What do you think? I, too, like the more traditional approach. But then, maybe our forefathers didn’t like seeing the words of the Bible being copied by a machine instead of a pious (or otherwise) monk. The words are important. The media (paper vs. electronic), not so much. You have a great point, Maddi. Thanks for being here. Using this logic, marriages can do away with rings: just wave your hand over the electronic device and say “I do.”. There is honor and respect to be accorded a rite, and virtualizing that rite cheapens it for us all. All you say is true, Fred, but like I said there are plenty of people who do silly things like get married by Elvis, too. So glad you could join our discussion. To me, it’s not disrespectful or cool. It’s a bit sad, actually. I’m going to sound like a grumpy old woman when I admit that some advances in technology steal a bit of our traditions. For instance, I think it’s great to show that you’re hip and with the times, and if you want to make the point with an electronic device, okay. It just lacks something special. 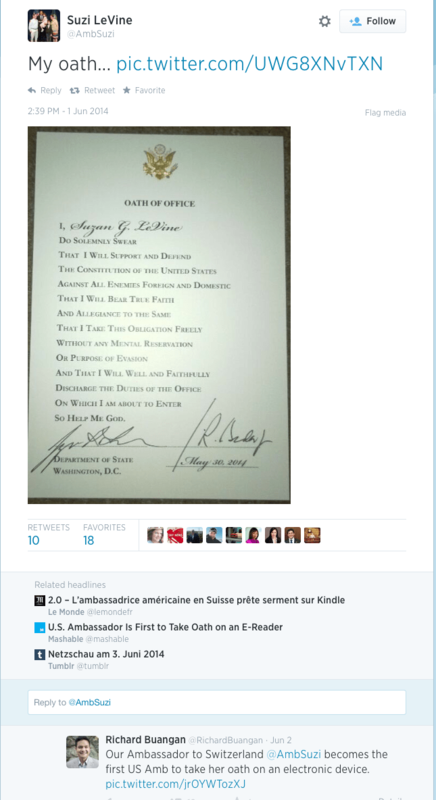 I loved that President Obama took his oath of office on dual Bibles: Lincoln’s and MLK. To me, that makes a point. It’s thoughtful and meaningful. It pays tribute to the past while stepping into the future. Also, I haven’t yet made the leap to digital books. I really don’t want to. Each time a book store closes it’s doors, I feel so sad. I’m just hanging onto my paper books. I love the feel of them when I flip the pages. It reminds me of the days of my youth when I hid books under the dinner table or falling asleep with them on my chest. I encourage my kids to read physical books. I guess I’ve turned into that fuddy duddy. Oh, well. Lol. Interesting and thought-provoking post, Diana! I’m with you Kim, and the dual Bible example is spot on. It made us all realize how deeply our President felt about his oath. Too bad his new ambassador doesn’t feel the same way. Love that you were here to be part of the discussion.